In an enthralling article, “Us and them: The enduring power of ethnic nationalism”, Jerry Muller has argued that although we generally tend to belittle the role of ethnic nationalism in politics, “it will drive global politics for generations to come”. The rise of Abiy Ahmed Ali (42) as Prime Minister of Ethiopia on April 2, 2018 and his bold move to open up Ethiopia to political reforms and to end hostilities with Eritrea heralded an era of peace in the turbulent Horn of Africa. But the ascendancy of the first-ever ethnic Oromo to the helm of the Ethiopian state in modern times is fuelling ethnic nationalism and putting a sharp focus on the Oromo people as the centrepiece of an imagined Oromo-Somali ‘Cushitic Alliance’ as a new axis in the Horn of Africa politics. The numbers and wide geographical spread of the Oromo, the largest ethnic group in the Horn of Africa, has put them at the apex of this residual nationalism. By 2015, the Oromo, and an Afro-Asiatic linguistic group in the Horn of Africa, represented 34.5 percent (over 40 million) of Ethiopia’s population, half a million people in Kenya and 42,000 in Somalia. Prompters of the Oromo-Somali ‘Cushitic Alliance’ are seeking to replace the old geopolitical alliances based on the nation-state, which before April 2018 seemed to rest on a sturdy ‘Bantu-Amhara Alliance’. Before the 1935, Italian occupation, Ethiopia always imagined itself as an ‘Asiatic power’, and not an African empire. But Fascist Italy’s brutal conquest and Haile Selassie’s own humbling exile in England (1936-40) transformed Ethiopia into a symbol of African nationalism. As Jeremy Murray-Brown noted in his biography, Kenyatta: A Biography, in 1931 Mzee Jomo Kenyatta had kept the red, green and gold Ethiopian flag in his room at 75 Castle Road England commemorating a year after Haile Selassie was crowned Emperor having resisted colonisation by Fascist Italy. In exile, Emperor Haile Selassie met Kenyatta and other pan-Africanists. After independence, Kenyatta invited the Emperor during the Jamhuri Day celebrations in June 1964, and named ‘Haile Selassie Avenue’ in the honour of his Ethiopian friend. Notably, in his 15-year presidency, Kenyatta made only two foreign trips: one to England in July 1964 and the other to Ethiopia where fighter jets formed the name ‘JOMO’ on the sky in 1969! Haile Selassie also hived off a prime piece of land next to the British Embassy, allocating it to the Kenyan Embassy in Addis Ababa. However, the ‘Bantu-Amhara Alliance moved to a new concrete level on December 27, 1963 following the signing of the Kenya-Ethiopia Mutual Defence to contain Somalia’s expansionist ambitions in the Horn of Africa by annexing Ethiopia’s Ogaden region, Kenya’s North-Eastern District and Djibouti. At the heart of ethnic nationalism in the Horn of Africa is the long and vexed history of accords and discords involving the “highlanders” (Bantu-Amhara) and the “lowlanders” (Oromo and Somali) in the Horn of Africa. Pan-Somali ethnic nationalism propelled by Somalia’s territorial claims against its neighbours led to four wars with Ethiopia: the 1960-1964 Border War; the 1977-1978 Ogaden War; the 1982 border clash and the 1998-2000 cross-border warfare during the turbulent era of warlords. It also contributed to the Somali Secessionist War (Shifta war) in Northern Kenya (1963-1968) and, to a great extent, the Djiboutian Civil War (1991-1994). Today, a mix of Islamism and pan-Somali nationalism are also driving Al-Shabaab’s war against its neighbours and Internationally-backed Federal Government of Somalia in Mogadishu. More broadly, proponents of the ‘Cushitic Alliance’ see the rise of Abiy as a return to the glorious years of Oromo power from the 18th century to the 19th century when they were the dominant influence in Ethiopia. In this configuration, the African Mission in Somalia (Amisom) fighting against the Al-Shabaab is redefined as part of the “Bantu-Amhara” military offensive involving mainly Kenya, Uganda, Burundi, Djiobouti and Ethiopia (before April). Publicity of the Oromo-Somali Cushitic Axis has been kept low and out of the diplomatic purview. But paradoxically, it is the Eritreans, themselves “highlanders”, who are the theorists and prime movers of the idea. The us-versus-them Bantu-Cushitic divide is based on the logic that “the enemy of my enemy is a potential friend”. 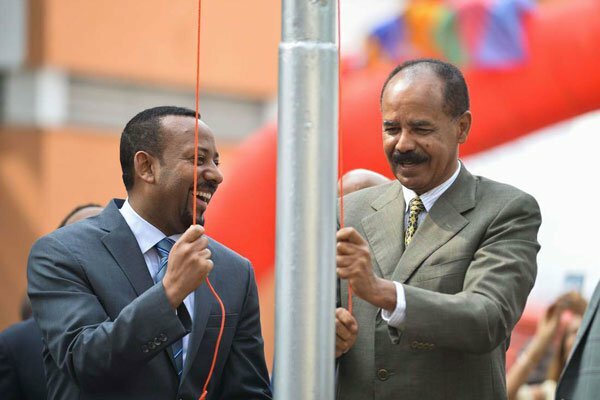 President Isaias Afwerki and his Eritrean People’s Liberation Front (EPLF) have always blamed former Ethiopian Prime Minister Meles Zenawi’s Tigray People’s Liberation Front (TPLF) and the Amhara Democratic Party (ADP) within the EPRDF for the Eritrean — Ethiopian War (1998- 2000) and Eritrea’s subsequent isolation. Isaias has seized his détente with Abiy, as the leader of the Oromo Democratic Party (ODP) and chairman of Ethiopia’s ruling Ethiopian Peoples’ Revolutionary Democratic Front (EPRDF), as an opportunity to vanquish and isolate his foes in Ethiopia. He has carefully wafted the idea of a Cushitic Alliance through a flurry of tri-lateral meetings with Abiy and Mohamed Abdullahi “Farmajo” of Somalia. Geopolitical rivalries involving the Gulf States are adding a dangerous twist to the new politics of difference. In its recent report titled, “The United Arab Emirates in the Horn of Africa” (November 6, 2018), the Belgium-based think tank, the International Crisis Group, highlights the contradictory role of the Gulf states in the Horn of Africa. While the diplomacy and aid of the UAE and Saudi Arabia, were pivotal in the peace agreement that normalised the Eritrea-Ethiopia relations, competition with Qatar and Turkey has aggravated friction between Mogadishu and Somali regional leaders. The less ideological technocratic wing of the Somalia Government is looking to Kenya and Ethiopia to soar its economic recovery plan. Alliances based on recidivistic nationalism can only undermine the war on Al-Shabaab and Somalia’s recovery.